Two Interesting Areas on the Moon. 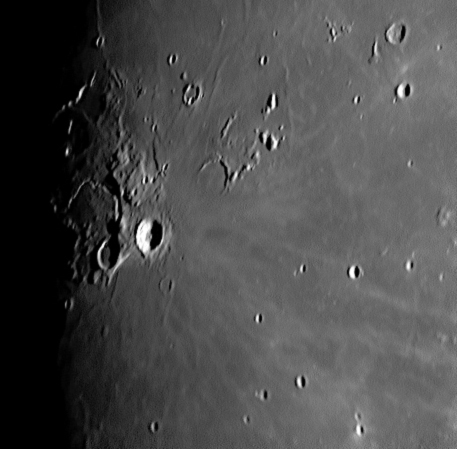 On March 16th 2011, the phase of the Moon was favourable for imaging two very interesting locations on the Moon, the crater Aristarchus and the nearby Schroter's Rille and the really interesting impact basin, Mare Humorum. The seeing was very, very poor so the images in the .avi files were jumping all over the place and I had real problems getting a sharp focus. 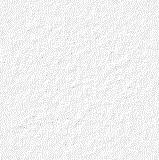 Each image was produced from a 60 second .avi file at 10fps, about 600 images in total. The images were aligned and stacked with Registax5, which chose about the best images from each set of 600. The final image was produced using Levels and Unsharp Mask in Photoshop. 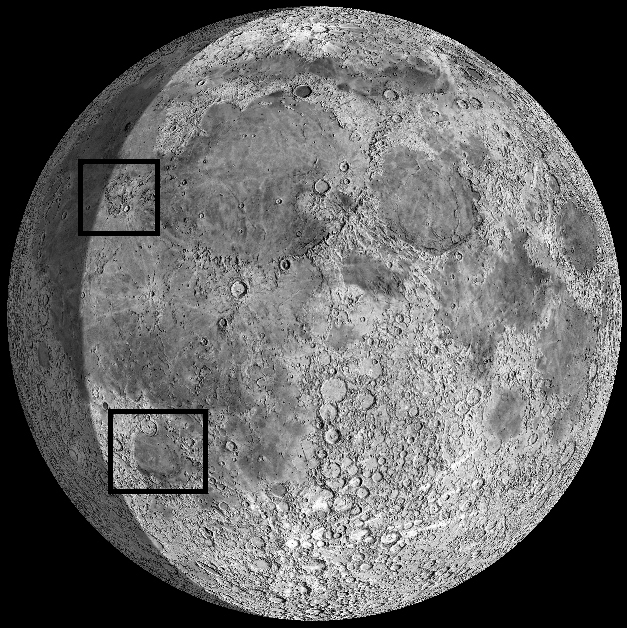 This image shows the graphic produced by the Virtual Moon Atlas software around the time that the images were produced, 1930UT on 16th March 2011. The top rectangle shows the position of Aristarchus and Schroter's Rille while the lower rectangle shows where you will find Mare Humorum. As you can see, both regions were just clear of the lunar terminator. 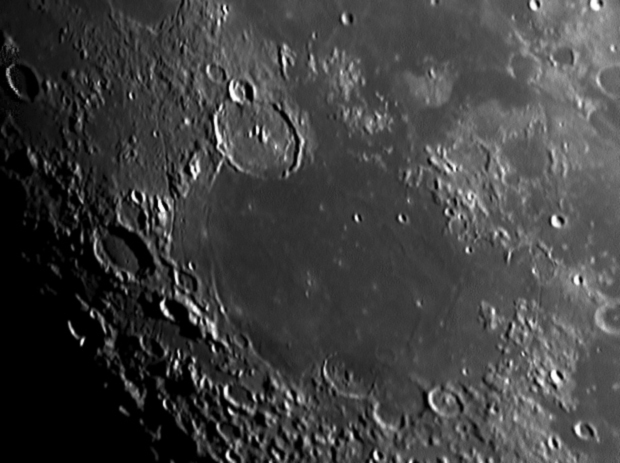 The 40km diameter crater Aristarchus and its ray system make up the brightest feature on the Moon. Their brightness is due to their youth, they may be as little as 300 million years old. Just to the west lies the older and smaller ( 34km diameter) Herodotus. This crater has a flat, lava flooded floor. Just to its north is the Cobra's Head, the source of the lave which gouged out the 160km long ancient lava channel known as Schroter's Rille, at times 10km across but narrowing to about 0.5km as it meanders north, west and finally south west. This 400km diameter impact basin may be as old as 4.2 billion years but the lava eruptions which flooded its floor may not have ended until 3 billion years ago. Between these two events, a number of craters formed around the basin. Craters inside the basin have been covered by the mare lavas but those which formed around the basin rim have survived. As the basin filled with lava, the weight caused its floor to sink, tilting the craters towards the centre, allowing lava to breach partially flood some craters. The dropping of the basin floor also produced compression wrinkle ridges, seen in the eastern part of the basin. This compression caused tension cracks to appear in the outer regions of the basin such as the three concentric lines known as Rimae Hippalus. The largest crater, Gassendi is 100km in diameter.